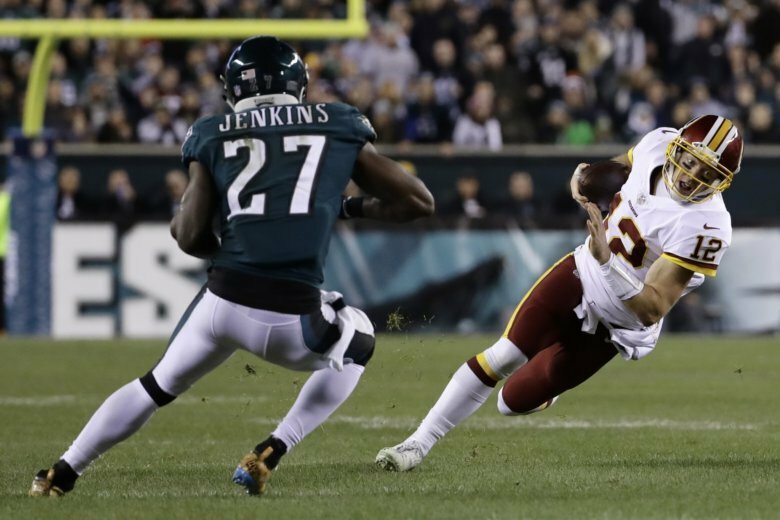 Washington Redskins' quarterback Colt McCoy is out for the rest of the season after suffering a broken leg during Monday night's game against the Philadelphia Eagles. WASHINGTON — Washington Redskins’ quarterback Colt McCoy is out for the rest of the season after suffering a broken leg during Monday night’s game against the Philadelphia Eagles. McCoy went down with a fractured right fibula at the end of the first quarter, ESPN reports. He was ruled out by the team before the second half began. McCoy was injured on a scramble on the final play of the first quarter, his leg whipping around and hitting Eagles’ safey Malcom Jenkins. McCoy finished the last two plays of the series and was seen limping along the sideline before being escorted to the locker room, The Washington Post reports. McCoy is the second Redskins quarterback injured this year. Alex Smith broke his leg in November during a game against the Houston Texans.